Towards the end of February Prior General Fray Miguel Miró, Prior Provincial Fray Dionisio Selma and outgoing San Sebastian Convent Prior Fray René Paglinawan paid a visit to Senator Cynthia A. Villar in the historic city of Las Piñas in Metro Manila. Today Las Piñas is synonymous with its world-famous Bamboo Organ inside its parish church. The historic visit was planned at the provincial curia in Quezon City a couple of days before the three Capitular Fathers took the plane for the Visayas. They were to join the 24 religious in the two-week 7th Provincial Chapter of the Province of Saint Ezekiel Moreno at the Talavera House of Prayer in Barangay Quiot, Cebu City. Despite the traffic mess apparently common in Manila, they reached Las Piñas in less than an hour, thanks to the expert driver Monching. At the church patio of Saint Joseph parish church, the concrete statue of the iconic friar Padre Diego Cera de la Virgen del Carmen silently greeted them. At once the newly re-elected prior provincial noticed and lamented the absence at the metal marker of the statue’s foot of anything that identified the confrere Fray Diego as Augustinian Recollect. Even the metal historical landmark at the façade of the Temple of God, now 243 years old, dedicated to the foster father of Jesus, was likewise bereft of the acronyms OAR, ORSA nor of Agustino Recoleto, Augustinian Recollect. There is nary a hint of grateful mention of the Spanish friar’s religious order. Its illustrious member Padre Diego Cera of Aragon, Spain, and his handcrafted Bamboo Organ had placed Las Piñas in the cultural map of the world. Bereft further of religious affiliation too is the Diego Cera Avenue that separates the Church of the Bamboo Organ from Saint Ezekiel Moreno Hall. But then, this is pursuant to provisions of a Philippine law prohibiting any professional title or religious affiliation in street names. The three priors knelt down and prayed before the Blessed Sacrament inside the stone house of God where the hardworking Padre Diego and the exemplary Padre Ezekiel Moreno, parish priest in 1876-1879, prayed as well decades before. They all looked up at the choirloft and marveled at the iconic Bamboo Organ, hand-crafted in 1819-1825. The parish museum beside the divine temple was filled with noisy high school students from nearby Saint Joseph’s Academy. The museum has a large framed photo of Padre Diego, a metal bust of bearded Saint Ezekiel, paintings and pictures of old Las Piñas town and church, and a small pipe organ. Near the exit were a showcase of souvenir items, religious articles and copies of Helen Samson-Lauterwald’s Bamboo Organ book. Fr. Selma carefully sat on a sturdy antique chair. The curator’s assistant was informed that the visiting priests were senior citizens and confreres of Saint Ezekiel and Padre Diego and no museum entrance fee was charged. The San Sebastian van proceeded to Santuario de San Ezekiel Moreno, ten minutes away. Architect Claude Edwin Andrews had designed it. The church is the biggest ever constructed by Vista Land, a corporation owned by the Villar family. For four decades, the family is known to be builder of residences and memorial homes and developer of subdivisions. At present, they have constructed houses of God in Iloilo, Cagayan de Oro, Alabang, Tagaytay, etc. The construction of Santuario de San Ezekiel Moreno commenced in May 2011. It is located in the compound of the headquarters of Villar SIPAG (Social Institute for Poverty Alleviation and Governance) Center, Barangay Pulanglupa Uno, C5 Extension Road in Las Piñas City. The bright interior of the Santuario without columns was the work of Architect Joey Amistoso. The gilt retablo was a fine sight to behold with the sacred images and that of Lady of Buen Suceso, patroness of the Diocese of Parañaque-Las Piñas, at the apex. At the lateral wings, the stained glass rosettes depict the Saint on one side and on the other the episcopal coat-of-arms of Saint Ezekiel in Pasto, Colombia, depicting the pierced heart on a book with the text Fortitudo mea et refugium meum es tu (You are my strength and my refuge). The rosette of the coat-of-arms of Saint Ezekiel Moreno Province is prominent at the church façade. The Santuario was inaugurated by the local Ordinary Jesse Mercado on 19 August 2014. The diocesan rector, Recollect priests from Manila and Cavite and ex-provincial Father Regino Bangcaya concelebrated the holy Mass with the bishop. Las Piñas residents, Secular Augustinian Recollects from Cavite City and devotees of Saint Ezekiel occupied the 700-seater temple with countless parishioners standing at the aisles, huge frontal and lateral doors. Bishop Mercado blest the Museo de San Ezekiel after the Mass. At her speech during the lunch tendered for the guests at the nearby Villar SIPAG Center, Senator Cynthia A. Villar could never forget how in 2011 her family was given a special guided tour by no less than the former prior general Father Javier Pipaón at Monteagudo, Navarra, Spain. It was a guided tour of the Recollect convent where Bishop Ezekiel spent his last days on earth and passed away on !9 August 1906 in the odor of sanctity. 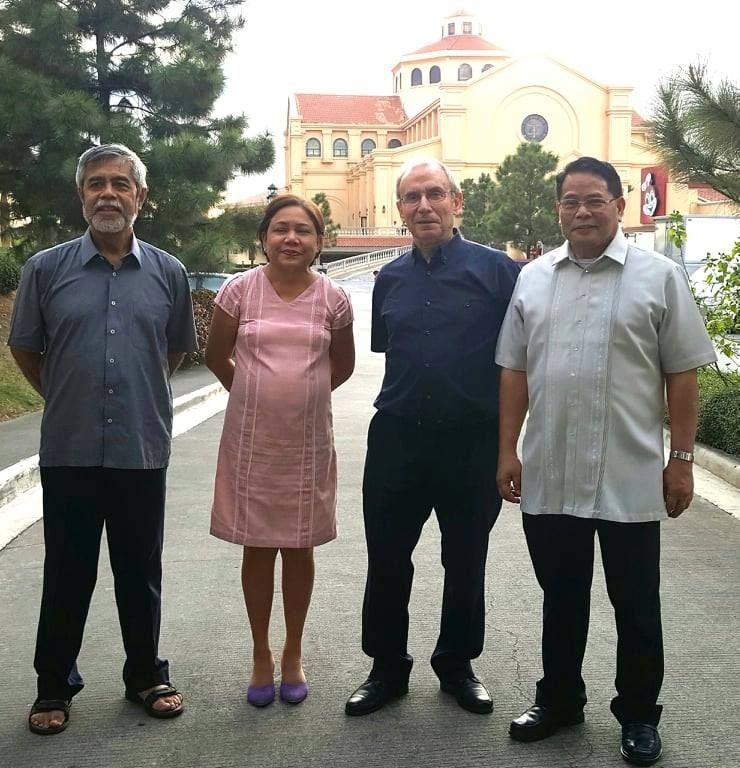 Senator Villar met with the three priors who had earlier viewed and admired the interior of the 200-million-peso Santuario. They did not visit the Museo de San Ezekiel which was closed for renovation. The lady senator had rushed from the Senate in Manila where her Agriculture Committee had conducted in the morning a hearing on the National Food Administration (NFA) rice shortage. Days later the hardworking senator flew to Boracay for an ocular inspection of the world-renowned beach resort and her Senate Committee on Environment and Natural Resources conducted a hearing on the ecological woes of the primary tourist destination. The senator conversed with the prior general from Tarragona in Catalonia, Spain, through Fr. Rene Paglinawan’s help as interpreter. Fr. Miró then gave various medals with relics of Saint Ezekiel to the senator who said she would share them with her husband ex-Senator Manny Villar and children. After the native snacks, they all proceeded to view handcrafted artifacts made from water lilies and labelled photos at the Villar Legacy Museum inside the Center. She gave the visiting priests a bag each of native products and publications on her cherished advocacies, poverty-reduction programs, farm schools and other pro-poor projects in Las Piñas, Manila, and other parts of the Philippines. On the way to the shop where strips of plastic waste were transformed into 20-kg. school armchairs, the visiting priests observed the incredibly clean water of Las Piñas River, another favorite eco waste-management project of Villar SIPAG Center. Their last stop was spent at the coffee shop inside the family-owned commercial center where over cups of cappuccino and brewed black coffee. Senator Villar got to know the Augustinian Recollects better. She rued that the Santuario de San Ezekiel could not be handed over to the Recollects. Father Miró then invited her to visit the general curia in a future visit to Rome. It was past 7:00 PM when the prior general checked in at Terminal One of the Ninoy Aquino International Airport after a twenty-minute drive. The Qatar Airlines flight was scheduled at 12:01 AM. It was a historic visit of sorts and the good senator got to know and appreciate the charism and mission of the Augustinian Recollects whose sons Padre Diego Cera and Saint Ezekiel had bequeathed the intangible heritage of faith and spread the Good News of Jesus to her forbears. Furthermore, the iconic Recollect friar brought worldwide fame and tangible cultural legacy to the Filipino people and to Senator Cynthia A. Villar’s native Las Piñas as the City of the Bamboo Organ.